She’s set to return as Sansa Stark for the final series of Game Of Thrones next month. 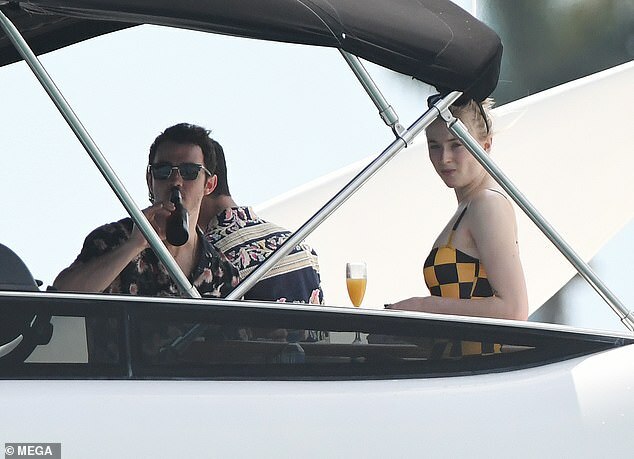 And Sophie Turner, 23, enjoyed some downtime as she joined her fiancé Joe Jonas, 29, his brothers Kevin, 31, and Nick, 26, as well as Priyanka Chopra, 36, for a boat ride around Miami, Florida. The actress appeared in great spirits as she and Nick’s new wife Priyanka giddily waved their hands in air during their time on the watercraft. Exhibiting her envy-inducing physique, the screen star slipped into yellow checkered swimsuit, complete with a trendy squared neckline. The Another Me actress displayed her naturally glowing complexion as she went make-up free for the outing, and swept her blonde tresses into a loosely-tousled bun. Earlier that day, the Northampton native enjoyed a scenic stroll around the Florida city with her husband-to-be Joe and his family. The blonde beauty opted for a casual display as she teamed a pair of khaki green cycling shorts with an oversized navy tee. Sophie’s outing comes after she insisted that she has not given away the ending of Game of Thrones. The TV star told Entertainment Weekly she has only told two people, including her fiancé Joe. The speculation that Sophie had told several people of the show’s ending came due to an interview she gave to W Magazine. However, Sophie has now clarified only Camp Rock star Joe and another friend are aware of how the show will end. The final batch of episodes of Game of Thrones will begin airing on April 14 and finish on May 19. Sophie and Joe were first romantically linked in early November 2016 after attending a pre-MTV Europe Music Awards Kings of Leon concert in the Netherlands. Speaking to People earlier in the year, Joe’s dad, Kevin Sr., gushed about how ‘blessed’ they were to have Sophie as part of their family.